If you have ever wished you could display seconds in the StatusBar clock you will be glad to know that a recently released Cydia tweak will enable this functionality. This Cydia tweak is called StatusBarSeconds and as explained prior it will add seconds to the StatusBar clock. The developer of the tweak notes that this tweak could have varied uses including easily telling whether or not your iPhone, iPod Touch or iPad has crashed. If you are interested in StatusBarSeconds you can find it through the BigBoss repo for free. Twitter is becoming more and more popular as time goes by. In fact Apple even integrated Twitter into the iOS 5 firmware generation, which shows just how popular Twitter has become. Have you ever wished that there was a quick and easy way to share a song you are currently listening to on Twitter? 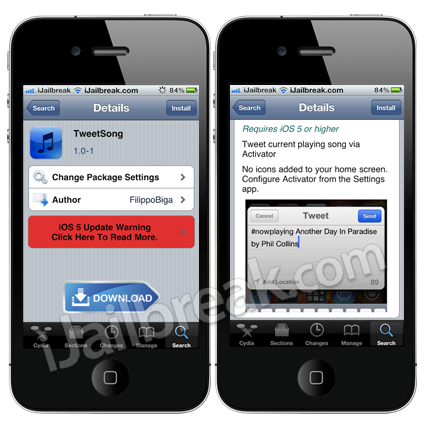 If you answered yes to this question you will be glad to know that using the TweetSong Cydia tweak you can automatically tweet a currently playing song using Activator. Meaning you can customize the method in which the tweak is activated using a gesture or button combination that suits you. If you are interested in TweetSong you can find it through the BigBoss repo for free. Have you ever wished there was a quick way to use your iPhone 4/4S’ as a flashlight? How about a strobe light? If you answered yes to any one of those questions you will be glad to know there is a recently released Cydia application that combines the functionality of FlashLight with a StrobeLight together. This Cydia application is called Bright Light, and it is a quick and easy way to take advantage of your iPhone 4/4S’ LED light. While there is other Cydia tweaks available which can integrate this functionality natively, Bright Light is a great alternative if you prefer this LED light functionality in an application form. If you are interested in Bright Light you can find it through the BigBoss repo for free. If you are looking for a new way to scroll on your iPhone, iPod Touch or iPad then the SuperScroller Cydia tweak is for you. You see, the tweak allows you to set an Activator command, and then upon completing that Activator command the tweak will begin scrolling automatically for you. If you are interested in SuperScroller you can find it through RPetri.ch repository (http://rpetri.ch/repo) for free. Let us know what you think of these jailbreak tweaks below. Constantly crashes Springboard. Adds the seconds at the expense of the date. I’ve removed it.